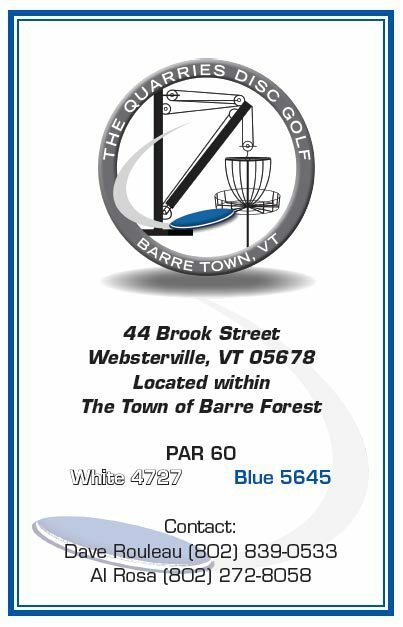 This 18 Hole Free Public course, located in the Town of Barre Forest, Websterville, VT, was founded by local residents and disc golf enthusiasts David & Donna M. Rouleau, Al Rosa and Doug Anderson, and was designed by Al “ALPO” Rosa. The project was developed with the support of the Barre Town Recreation Dept., Town of Barre Select Board, Carl Rogers (Town Manager), Vermont Land Trust (Jonathan Decker) and the VLT Stewarship Forester (Dan Kilborn). Funding for the project was done via one-time sponsorship/donation of the baskets by local businesses along with a $2500 grant from the Ronald McDonald House Charities and was underwriten by The Barre Town Thunder Chicken Snowmobile Club. Basket Donator’s names are located on the tee box signs. Countless hours were logged by many volunteers bringing this asset to our community during the months of July, August, September and October 2013. Many thanks to all for a job well done !